2014 is a Sport Relief year (where sporting challenges become the focus for the Comic Relief fundraising) and Team Honk has come up with a brilliant way for the blogging community to be involved and hopefully raise over £20,000 for Sports Relief. On the 12th of January a baton relay was started at Land's End, bloggers from all over the UK will be passing a baton along a very circuitous route of the UK, powered by foot, scooter, bike, train, raft and any other viable form of transport until it reaches John O'Groats - hopefully on March 23rd. 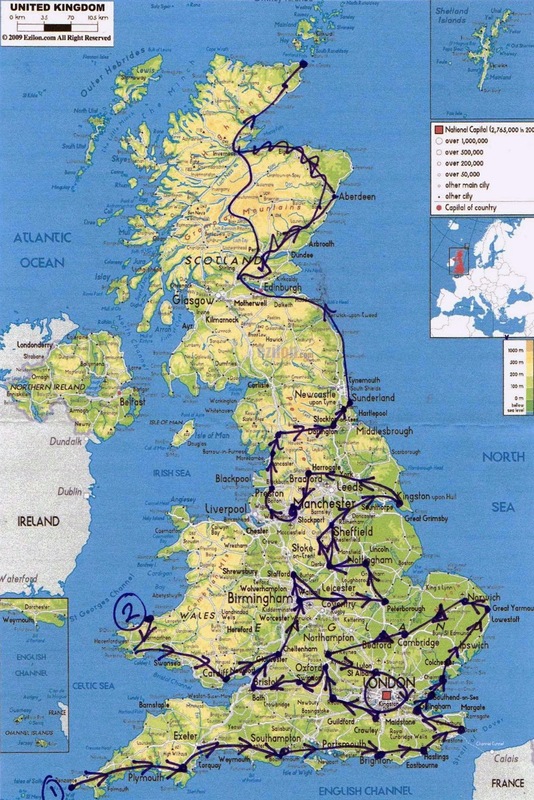 You can see just how circuitous the route is here on the official Team Honk Baton Relay Map - it involves over 200 bloggers plus their friends and families and 38 regional teams all doing their bit to raise awareness & funds for the Comic Relief charity. Well I am delighted to be involved in the 2014 Team Honk relay, mine may only be a lowly role of getting the baton into the right location for it's big London kick off, but it's still an important cog in a very big machine. So let the juggling commence because on Monday 3rd February Daisy returns to Great Ormond Street for some minor surgery (which does incorporate an airway assessment to assess her risk for future anaesthetics & let's be honest, there's no such thing as minor surgery where Daisy is concerned) and some very complicated tests that will take all week. However thanks to my ever patient husband who remains resolutely unfazed by my ability to complicate our ever complicated lives with my "projects", I will be able to do my bit for Team Honk. The following day at approximately 5pm I will rendezvous with my lovely chum Steph from the blog Stephs Two Girls at the champagne bar at St Pancras station where she will bring in the baton from the St Albans leg of the relay to start it's London journey. Never one to miss an opportunity of combining my two main interests of blogging and running I will be wearing my best running kit teamed with an official Comic Relief T shirt (yet to be bought but on my to do list) and after a quick call to Andy who will be preparing to take over the night shift with Daisy, I will run home to Wimbledon (approximately 12 miles but this does not take into account weaving around pedestrians), where I will rendezvous with Sophie from Franglaisemummy and entrust the baton to her care. (Sophie and other members of the London based blogging community will be taking it to Comic Relief Headquarters the next day and spending the day playing Honkopoly, the London contribution to the Team Honk Relay). So why am I putting myself through this extra stress when I could have just made the most of an evening off hospital duties and put my feet up with the other children? I'm doing it because my small but hopefully significant leg of the Team Honk relay is being dedicated to a little girl called Alicia. Alicia and Daisy were always in hospital together, we had known eachother for many years and she was like a big sister to Daisy, waving at her through the window of her cubicle and drawing her pictures to brighten up her wall. Alicia had cystic fibrosis. A genetic disease which meant she fought for every breath as her lungs filled with sticky mucous, often she was on oxygen, dragging the cylinder behind her. We were in hospital together for Red Nose day 2009 and Daisy and Alicia made the most of it, dressing up and helping the nurses sell cakes to people coming to outpatients. 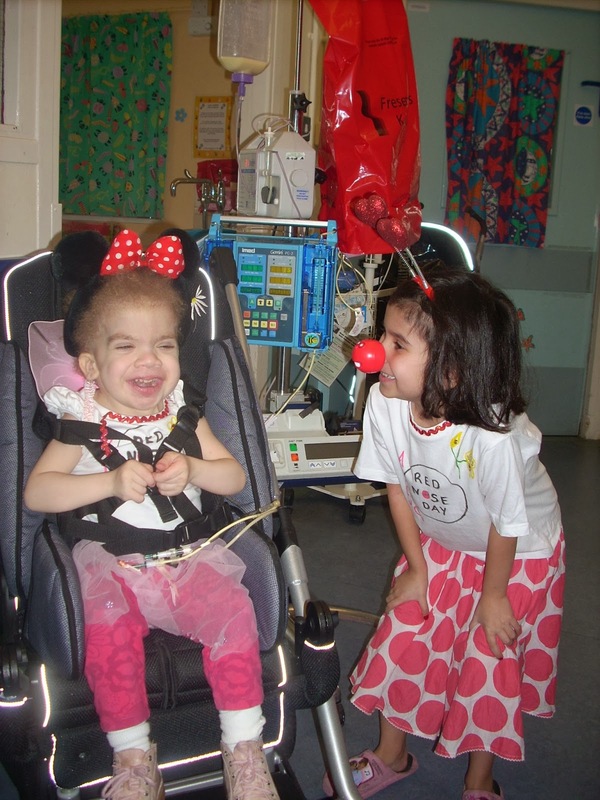 Alicia loved red nose day, it made a change from the day to day routine of the ward and she was always involved in some sort of fundraiser for charities, especially if it involved making and selling cakes. I vividly remember one of the Comic Relief appeal films that went out on the TV that night - it was about some children on a ward in a hospital, somewhere in Africa, the four children were desperately ill and needed oxygen but there was only enough equipment for 3 of them to be treated, one of them would die because resources were so limited to help. And it struck me that while our situation was so terrible on the surface, both children with dreadful, life limited diseases, in the lottery of life they had scored well as there as never a question about enough oxygen or antibiotics or IV fluids or any of the other essentials they needed to survive being available. Sponsor Team Honk at http://my.sportrelief.com/sponsor/team-honk-relay or alternatively you can text HONK to 70005 and donate £5 to Sport Relief. And if you want to get involved in this year's Sports Relief then the first ever Sainsbury’s Sport Relief Games take place from Friday 21st to Sunday 23rd March 2014. The public can join the fun and games by running, swimming or cycling their way to raising cash at over a thousand venues around the country, including the landmark events at Queen Elizabeth Olympic Park. Unfortunately I don't have an Andy, so Dominic's GOSH admission puts an end to me being able to do my leg in the relay... unless Andy is rentable, or we can do a mini leg from St Pancras to GOSH? It's lovely that you're running in memory of Alicia, it will be a good excuse to have a break from the ward too. Here's to Alicia, Daisy and you. I'll be thinking of you all as I try to stay on my scooter on Wednesday.